The Minister of Citizenship and Immigration, pursuant to section 10.3 of the Immigration and Refugee Protection Act, gives the annexed Ministerial Instructions Respecting Invitations to Apply for Permanent Residence under the Express Entry System (January 6, 2016). (1) For the purposes of paragraph 10.2(1)(b) of the Immigration and Refugee Protection Act, the number of invitations that may be issued during the period beginning on January 6, 2016 and ending on January 7, 2016 is 1,463. (2) Foreign nationals who, on January 6, 2016 at 13:28:25 UTC, have been assigned a total of 461 points or more under the Comprehensive Ranking System that is set out in the Ministerial Instructions Respecting the Express Entry System, as published in the Canada Gazette, Part I, on December 1, 2014 and as amended from time to time, occupy the rank required to be invited to make an application for permanent residence. 今天是不是有发邀请? 我是453分, 今天查邮件居然有invitation to apply…我之前还有安省的notification of interest, 我还是想走联邦邀请 安省的是不是我不用理就行了? 如果45天到期之后没交材料不就等于放弃了吗? The Minister of Citizenship and Immigration, pursuant to section 10.3 of the Immigration and Refugee Protection Act, gives the annexed Ministerial Instructions Respecting Invitations to Apply for Permanent Residence under the Express Entry System (January 13, 2016). (1) For the purposes of paragraph 10.2(1)(b) of the Immigration and Refugee Protection Act, the number of invitations that may be issued during the period beginning on January 13, 2016 and ending on January 14, 2016 is 1,518. (2) Foreign nationals who, on January 13, 2016 at 12:59:27 UTC, have been assigned a total of 453 points or more under the Comprehensive Ranking System that is set out in the Ministerial Instructions Respecting the Express Entry System, as published in the Canada Gazette, Part I, on December 1, 2014 and as amended from time to time, occupy the rank required to be invited to make an application for permanent residence. The Minister of Citizenship and Immigration, pursuant to section 10.3 of the Immigration and Refugee Protection Act, gives the annexed Ministerial Instructions Respecting Invitations to Apply for Permanent Residence under the Express Entry System (January 27, 2016). (1) For the purposes of paragraph 10.2(1)(b) of the Immigration and Refugee Protection Act, the number of invitations that may be issued during the period beginning on January 27, 2016 and ending on January 28, 2016 is 1,468. (2) Foreign nationals who, on January 27, 2016 at 13:44:40 UTC, have been assigned a total of 457 points or more under the Comprehensive Ranking System that is set out in the Ministerial Instructions Respecting the Express Entry System, as published in the Canada Gazette, Part I, on December 1, 2014 and as amended from time to time, occupy the rank required to be invited to make an application for permanent residence. The Minister of Citizenship and Immigration, pursuant to section 10.3 of the Immigration and Refugee Protection Act, gives the annexed Ministerial Instructions Respecting Invitations to Apply for Permanent Residence under the Express Entry System (February 10, 2016). (1) For the purposes of paragraph 10.2(1)(b) of the Immigration and Refugee Protection Act, the number of invitations that may be issued during the period beginning on February 10, 2016 and ending on February 11, 2016 is 1,505. (2) Foreign nationals who, on February 10, 2016 at 13:07:36 UTC, have been assigned a total of 459 points or more under the Comprehensive Ranking System that is set out in the Ministerial Instructions Respecting the Express Entry System, as published in the Canada Gazette, Part I, on December 1, 2014 and as amended from time to time, occupy the rank required to be invited to make an application for permanent residence. The Minister of Citizenship and Immigration, pursuant to section 10.3 of the Immigration and Refugee Protection Act, gives the annexed Ministerial Instructions Respecting Invitations to Apply for Permanent Residence under the Express Entry System (February 24, 2016). (1) For the purposes of paragraph 10.2(1)(b) of the Immigration and Refugee Protection Act, the number of invitations that may be issued during the period beginning on February 24, 2016 and ending on February 25, 2016 is 1,484. (2) Foreign nationals who, on February 24, 2016 at 13:03:55 UTC, have been assigned a total of 453 points or more under the Comprehensive Ranking System that is set out in the Ministerial Instructions Respecting the Express Entry System, as published in the Canada Gazette, Part I, on December 1, 2014 and as amended from time to time, occupy the rank required to be invited to make an application for permanent residence. The Minister of Citizenship and Immigration, pursuant to section 10.3 of the Immigration and Refugee Protection Act, gives the annexed _Ministerial Instructions Respecting Invitations to Apply for Permanent Residence under the Express Entry System (March 9, 2016). 1. (1) For the purposes of paragraph 10.2(1)(b) of the Immigration and Refugee Protection Act, the number of invitations that may be issued during the period beginning on March 9, 2016 and ending on March 10, 2016 is 1,013. (2) Foreign nationals who, on March 9, 2016 at 13:11:07 UTC, have been assigned a total of 473 points or more under the Comprehensive Ranking System that is set out in the Ministerial Instructions Respecting the Express Entry System, as published in the Canada Gazette, Part I, on December 1, 2014 and as amended from time to time, occupy the rank required to be invited to make an application for permanent residence. 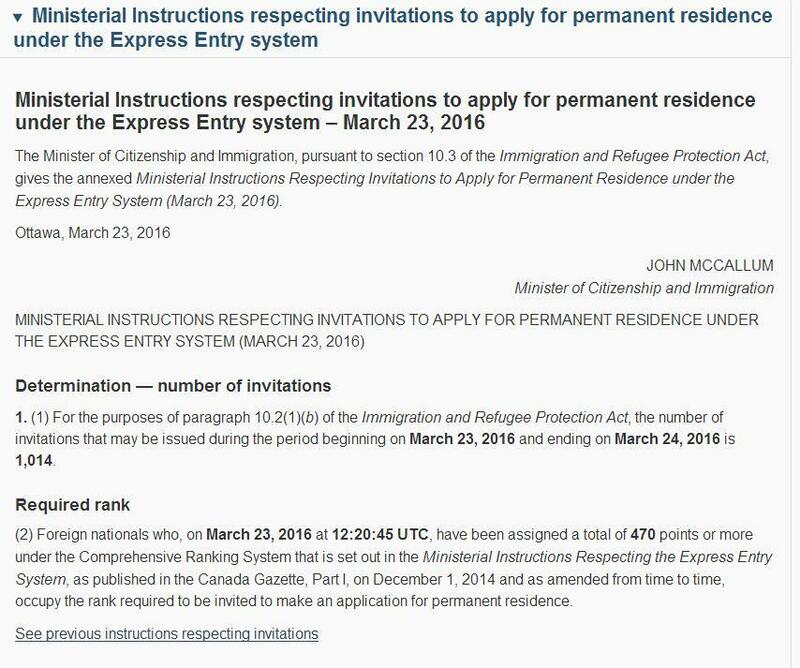 The Minister of Citizenship and Immigration, pursuant to section 10.3 of the Immigration and Refugee Protection Act, gives the annexed Ministerial Instructions Respecting Invitations to Apply for Permanent Residence under the Express Entry System (March 23, 2016). 1. (1) For the purposes of paragraph 10.2(1)(b) of the Immigration and Refugee Protection Act, the number of invitations that may be issued during the period beginning on March 23, 2016 and ending on March 24, 2016 is 1,014. (2) Foreign nationals who, on March 23, 2016 at 12:20:45 UTC, have been assigned a total of 470 points or more under the Comprehensive Ranking System that is set out in the Ministerial Instructions Respecting the Express Entry System, as published in the Canada Gazette, Part I, on December 1, 2014 and as amended from time to time, occupy the rank required to be invited to make an application for permanent residence.